As of August 1st, I’ve been reading my way round the world for five years and I’m at 135 countries accounted for — or 99 books read since I started (99½, actually). You can check the map here. Which means I’ve read 16 (and a half!) this year. Which is down from the rate I managed at first — 53 in the first two years — but about in line with what I’ve done since. So at least I haven’t slowed down even more. Or stopped altogether. A Woman in the Crossfire: Diaries of the Syrian Revolution by Samar Yazbek is well-written, interesting and informative. It’s becoming ever less topical as the situation in Syria moves on; but as long as we have dictatorships, the subject of life as a dissident in a (wobbling, unstable) police state is still going to have relevance. Survival in the Killing Fields by Haing Ngor and Roger Warner is a book that tells a remarkable story, of a man who survived the Khmer Rouge and ended up winning an Oscar for his performance in a film about it. Life and a Half by Sony Labou Tansi is yet another book about dictatorship, this time a dark, strange, poetic novel which I thought was very worth reading. And not recommendations exactly, but a few books which stand out in my memory because of their subject matter rather than their literary qualities: 88 Days (Somali piracy), The Chronicles of Dathra (Kuwaiti chick-lit, sort of), and African Philosophy (African philosophy). 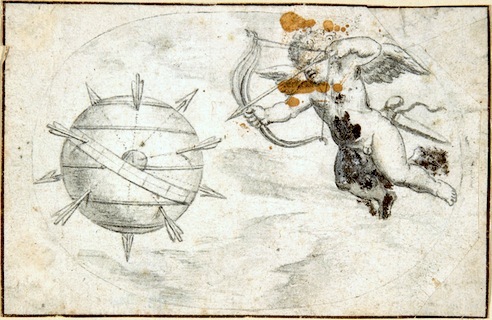 » Cupid Shooting Arrows at the World Globe is attributed to Otto van Veen and apparently 1608ish. From the Met. Wow, that’s quite an achievement. Congratulations! I hope I’m that far along five years into my effort. Are you finding that the remaining countries are harder to find books for? Or did you plan more in advance than I did? I have various places where I keep semi-organised lists of possible books for the various countries. Like this map, for example. And I try to have a few books on hand all the time so that I have a choice about what to read next. So every so often I spend some time researching new possibilities, but there are still plenty of countries I don’t have a book for. I didn’t want to just do all the easiest countries first and be left with all the most peculiar books at the end, so some I just haven’t really looked at yet, like Sweden and Denmark, but others are genuinely very difficult and I’m not sure I will ever find a good solution for: the perfect example would be Comoros, a very small poor country with very little publishing where if they are going to write in a foreign language it’s likely to be French or Arabic rather than English. But I have got a lot of practice at this now, and if you’re determined enough you can usually find something. Apart from the obvious (specialist publishers and bookshops, Goodreads, Amazon, Wikipedia, the British Library catalogue), there are several people who have been doing the same project: Shoshana, Ann Morgan, Paul Kron and so on.